Cherry Tree Bungalow01263 715779work01603 870304fax Self-cateringThis quaint semi-detached bungalow has a lovely rear garden with comfortable furniture. The property sits in a tranquil and secluded area of Burnham Thorpe, the birthplace of Admiral Lord Nelson. Popular for its pubs, the surrounding area enjoys some good walks, shops and restaurants. Guests can also travel a short three miles to the wonderful sandy beach at Holkham. 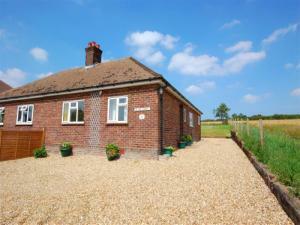 This quaint semi-detached bungalow has a lovely rear garden with comfortable furniture. The property sits in a tranquil and secluded area of Burnham Thorpe, the birthplace of Admiral Lord Nelson. Popular for its pubs, the surrounding area enjoys some good walks, shops and restaurants. Guests can also travel a short three miles to the wonderful sandy beach at Holkham. Take the B1355 towards Burnham Market. Through North and South Creake. Burnham Thorpe is signposted. Follow road round past Nelson's birthplace and continue to Flint Cottage facing you. The far cottage of this pair is the owners who will direct you to your holiday home. Taxi from King's Lynn or bus.